Proton is a declarative multitouch framework that allows developers to specify gestures as regular expressions of touch event symbols. 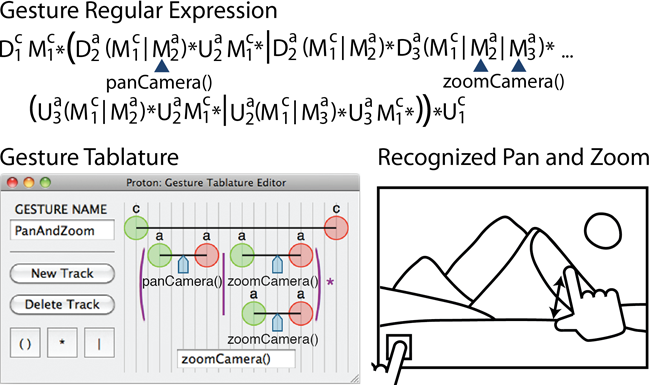 Proton converts the touch events outputted by multitouch hardware into a stream of touch event symbols that encode the touch action (down, move, and up), touch ID (e.g., first touch, second touch, etc.) and custom touch attributes (e.g., touch hit-target, touch direction, etc.). Developers describe multitouch gestures as regular expressions of these symbols, which Proton matches against the touch event stream. To get started read the tutorial. For the research papers, visit here and here.